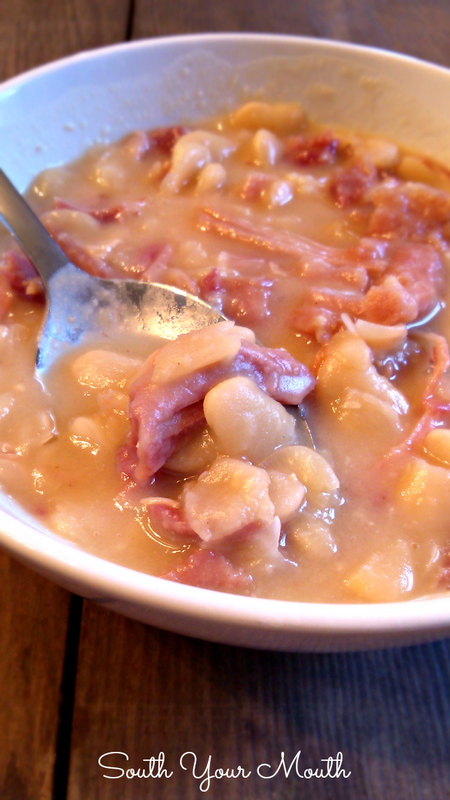 A tried and true recipe for dried beans and ham that is delicious served as a hearty soup or served over rice. My Angel Baby is a country girl! Or she would be if we lived in the country. AB will eat anything I throw at her and not bat an eye at it. I set the table for Sunday dinner and waited to see what reactions the ham and beans got. Flossy and Brutus wouldn't have anything to do with it but AB dove in with her spoon ablazin! I think just about every part of the US has some dish made with ham (or perhaps sausage) and some sort of dried bean. Where I’m from, we usually like to use dried butter beans. I grew up eating these served over rice but you can serve it like a soup too! Rinse beans per package instructions then add to a large pot or Dutch oven. Add remaining ingredients, cover and heat over medium heat until boiling. Reduce heat to low and simmer for 3-4 hours or until beans are tender. You can also cook in a crock pot 5-6 hours on high or 8-10 hours on low. Remove ham bone from pot to cool. Taste for salt and add if needed. I make mine a little on the salty side since I serve them over plain white rice so I usually have about 2 teaspoons total in mine. Once the ham is cool enough to handle, remove meat from the bone, cut or shred into small pieces. Add ham pieces to beans and stir well before serving. I serve mine over white rice topped with fresh diced onion but you can also serve this as a hearty soup. 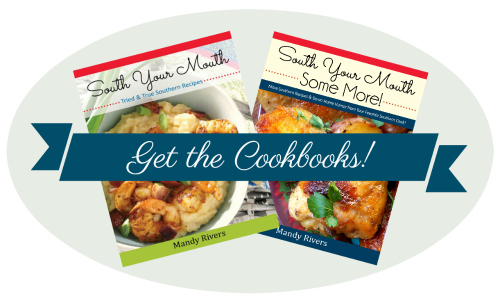 Either way, you’re going to want a big o’ hunk of Skillet Cornbread to go with it! We always use the small butter beans but feel free to use any dried beans. A lot of folks use the big butter beans (the “45s”) or great northern beans. I use white pepper in these because they cook up so creamy I like to keep things light but you can absolutely substitute with 1/2 teaspoon black pepper. 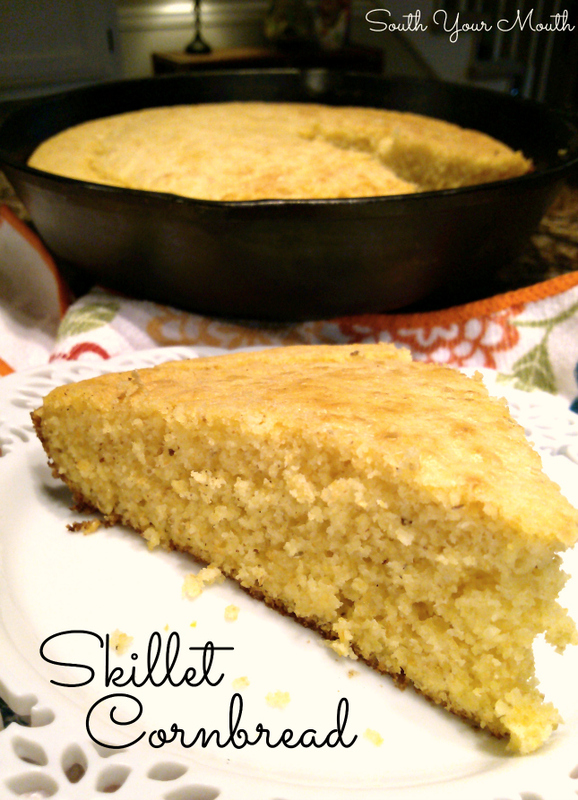 Click here for Skillet Cornbread recipe. Dang, I just about argued with you about it too! I looked at it twice before my brain finally got on board with what was wrong about it! I updated it! Thank you! Yum, we always make this with small red beans as a soup. My nephews (6, 8, and 10) love it! This recipe takes me back! I haven't had beans fixed like this in about 2 decades. I looked for ham hocks last week at Publix to go in a pot of collards and couldn't find any. I'm hoping it was just a slow pig leg day. I don't find cracklin's very often either. I used to love cracklin' cornbread made in my grandmother's cast iron skillet. We fixed a crock pot of pinto beans Monday and I eat them like soup. This sounds absolutely delicious! Pinning it! Thanks!! This is the best thing to do with leftover ham bone from Christmas - we look forward to it every year! Can't wait. And yours looks really, really good! I haven't this in a long time. Thanks for the reminder. We also enjoy it using black-eyed peas. Is five cups of water enough and has anyone tried it with broth? Yes, 5 cups of water is enough. You can use broth if you like though I've never found it necessary as long as I have a good bit of ham left on my bone. Try it soup style with a spoon of mayo in your bowl. Talking about good. Mandy ... this Midwestern gal turned front range of Colorado will be serving this via Crockpot tomorrow night with you Mom's Skillet cornbread. Need some warm southern comfort after work tomorrow night! This is a favorite family recipe; however, I always use pinto beans. This dish must be accompanied with hot, buttered cornbread and wedges of red onion, plus a little chili powder in the beans. Yummy! Most people tell me they have Biscuits with their bean soups or them as meal. I was brought up to eat Corn bread with them. Even dried Black Eye peas. Too each his own, but give me Home made Corn Bread any time with my dried beans or peas. This is my first time cooking through you web sight I am going to try your ham and beans , it sure does not call for a lot of ingredients . Got this in my crockpot now. Couldn't find hocks and didn't have a bone, so I used pieces of smoked ham and navy beans. It looks watery so I'm nervous, but it smells DIVINE! South Georgia girl here. Had a friend from California that made this with navy beans and called it her end-of-month meal because it was so cheap. She made huge fluffy biscuits, split them open on the plate and ladled the beans over. Sure tasted southern to me! I looked fwd to month-end. Im sorry but this picture is Northern beans not lima. In the south we make the soup with Northern beans. Lima beans have a green tint to them. From South Carolina here...those are "butter beans". My Colorado relatives call them "Lima Beans", but those are definitely not Northern Beans. This is exactly what the beans look like in my Gammie's recipe. My daddy used to make this . He would add some chunks of potatoes &onions. Then we added cider vinegar to our bowel if wanted. Good memory to have today.